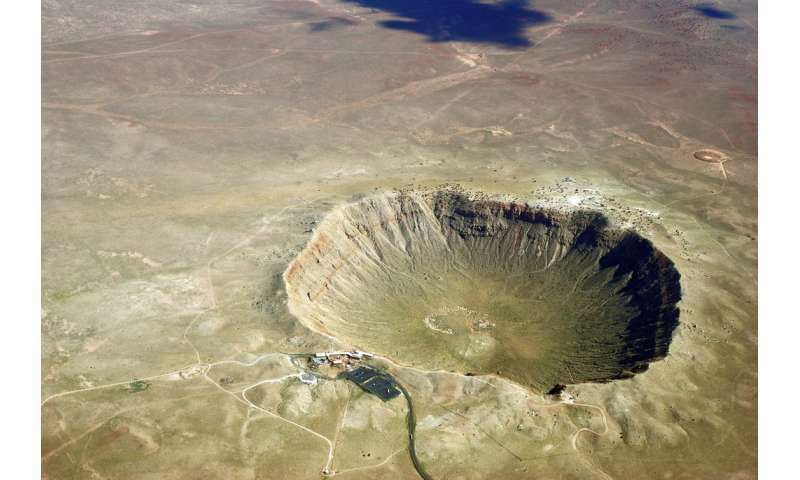 The Barringer Crater in Arizona is a famous example of meteorite impact site on Earth. Credit: Shane.torgersonhttps://commons.wikimedia.org/wiki/File:Meteorcrater.jpgCreative Commons Attribution 3.0 Unported license. Every day, Earth is constantly bombarded by about 100 tons of falling objects from space, mostly simple dust or sand-sized particles that are destroyed as they hit the upper atmosphere. But very rarely, a piece large enough to survive the intense heat of entry manages to fall all the way down to the Earth's surface, where its galactic journey ends with a bump. Most meteorites are so small that they don't make a dent in the ground. Larger rocks, however, leave their mark in the form of bowl-shaped impact craters. One famous example is the 50,000-year-old Barringer Crater in Arizona, which is 1.2 kilometers across and 170 meters deep. But impact craters have been observed not just on Earth; scientists have also spied them on Mercury, Venus and Mars, on our own Moon, and on the moons of Jupiter and Saturn. 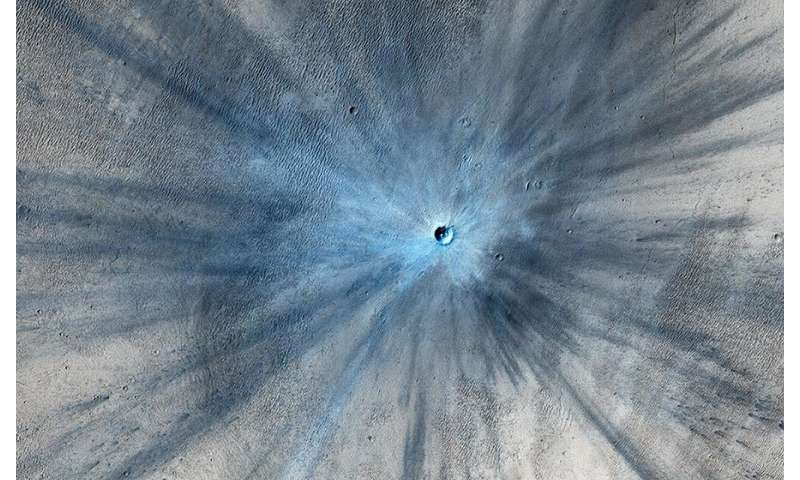 One feature of craters has puzzled scientists for decades. A meteorite's force of impact turns the ground into powder and throws that powder high into the air in a cone-shaped trajectory. The flying powder settles around the crater to form a blanket. But why are some blankets shaped like rays—the long, radial streaks that fan out from the crater's center like spokes on a wheel? In a new study published in Physical Review Letters, scientists from the Okinawa Institute of Science and Technology Graduate University (OIST) have simulated these extraterrestrial impacts to shed light on how these mysterious crater rays form. But there are some curious exceptions. It wasn't until Dr. Tapan Sabuwala of the Continuum Physics Unit (Prof. Gustavo Gioia) was watching ball-drop experiments by high-school students on YouTube one day that he found the first clue about what might be causing the rays: "These experiments are popular in science classes. I noticed that some of their experiments were producing crater rays." So what was the unique feature of these experiments? In a word: messiness. Researchers generally even out the surface of the sand bed before dropping the ball, but the videos showed school students skipping that step. Sure enough, when Dr. Sabuwala repeated the ball-drop experiment with an uneven surface, the mini-meteorites made crater rays. "That was the eureka moment." It still wasn't clear why uneven landscapes caused crater rays to form. So the team conducted a second experiment in a flat sand bed imprinted with a regular pattern of hexagonal-shaped valleys. Upon impact, all of the valleys touching the edge of the ball produced a ray. Christian Butcher, a technician in OIST's Fluid Mechanics Unit, repeated the experiment with different variables: "We changed the size of the ball, the distance between the valleys, the drop height of the ball, the grains in the bed, and so on," said Mr. Butcher. The only variables that affected the number of rays produced were the size of the ball and the distance between valleys. And there was another exciting twist to their model: It could also be used to learn about the meteorites that created craters. Based on how many rays a crater has, the researchers can work out the diameter of the meteorite that created it. "We can look at nearly any rayed crater with this model and learn about how it was made," said Prof Chakraborty.
" Earth constantly renews its crust, just as a snake does with its skin; it happens through the plate tectonics, volcano activity and constant approach of the new, extraterrestrial matter, which is estimated to be 4 000 – 100 000 tons per year. This data are the next fact by which the age could be determined.."
"(over 140 tons of space matter is falling daily to the surface of Earth)"
So how big was the meteorite that created the Barringer Crater? The scientists learning from the students. Not just a cliche but a truism. Next time someone is whinging about the time and cost spent in repetitious experiments? This is a shiny example of the continuing value of empirical evidence. No matter those who scornfully opinionate that such educational activities are trivial and banal.